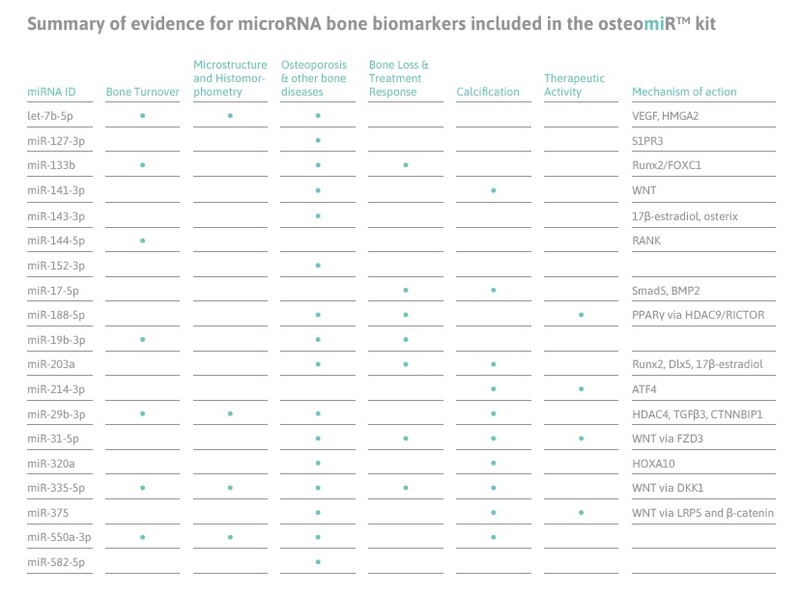 The osteomiR TM kit enables the simple and standardized analysis of specific circulating microRNAs in human serum and plasma, which reflect bone quality. 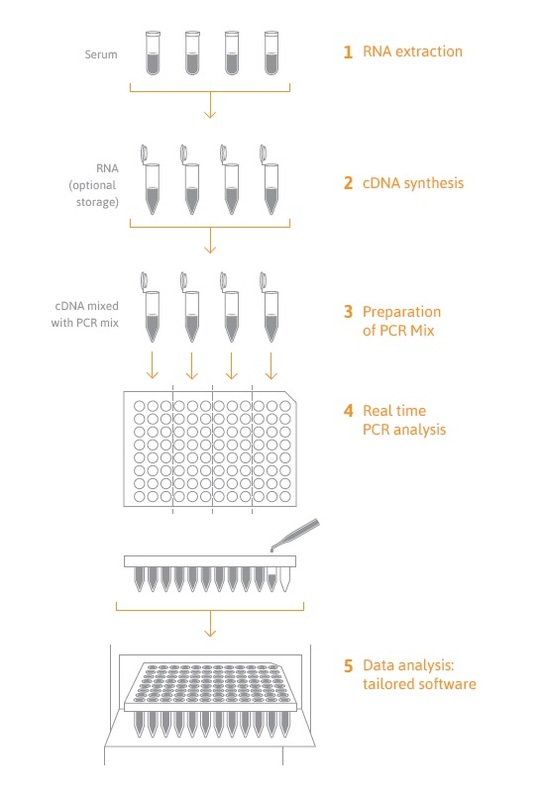 All-In-One kit: the osteomiR TM kit includes all reagents for the RNA extraction, cDNA synthesis, Preparation of PCR Mix, real time PCR analysis, data analysis: tailored software. Anastasilakis AD et al. Changes of Circulating MicroRNAs in Response to Treatment With Teriparatide or Denosumab in Postmenopausal Osteoporosis. J Clin Endocrinol Metab. 2018 Mar 1;103(3):1206-1213. Feichtinger X, et al. Bone-related Circulating MicroRNAs miR-29b-3p, miR550a-3p, and miR-324-3p and their Association to Bone Microstructure and Histomorphometry. Sci. Rep. 2018 20;8(1):4867. Kocijan R, Muschitz C, et al. Circulating microRNA signatures in patients with idiopathic and postmenopausal osteoporosis and fragility fractures. J Clin Endocrinol Metab. 2016 Aug 23. Heilmeier U, Hackl M, et al. Serum microRNAs are indicative of skeletal fractures in postmenopausal women with and without type-2 diabetes and infl uence osteogenic and adipogenic diff erentiation of adipose-tissue derived mesenchymal stem cells in vitro. J Bone Miner Res 2016 Jun 27. Mäkitie RE, Hackl M, et al. Altered MicroRNA Profi le in Osteoporosis Caused by Impaired WNT Signaling. JCEM 2018 ;Mar 1. Weilner S, et al. Secreted microvesicular miR-31 inhibits osteogenic diff erentiation of mesenchymal stem cells. 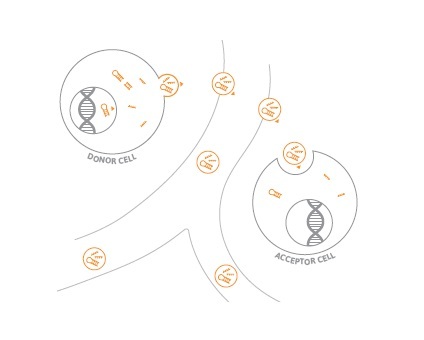 Aging Cell 2016; 1–11. Li D, et al, Osteoclast-derived exosomal miR 214-3p inhibits osteoblastic bone formation. Nat Commun, 2016, Mar 7;7:10872.